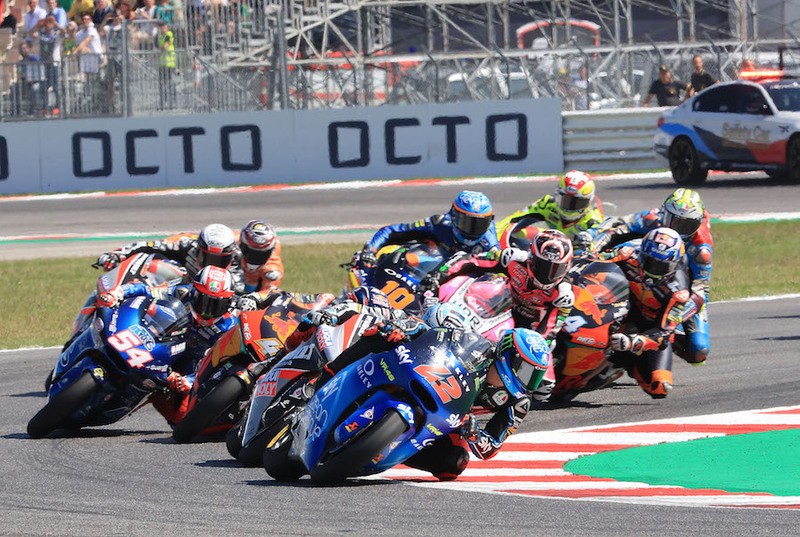 Francesco Bagnaia (SKY Racing Team VR46) converted pole position into his sixth Moto2 win of the season at the GP Octo di San Marino e della Riviera di Rimini to extend his Championship lead over second place Miguel Oliveira (Red Bull KTM Ajo) to eight points, with the Portuguese rider fending off Marcel Schrötter (Dynavolt Intact GP) on the final lap as the German secured his maiden Grand Prix podium in third. Bagnaia got the launch off the line and grabbed the holeshot, from which he never looked back. Compatriot Mattia Pasini (Italtrans Racing Team) was his closest challenger in the opening exchanges, keeping the gap to around one second, but the Italian couldn’t maintain the pace and eventually fell into the grasp of the chasing duo of Oliveira and Schrötter – the two locked together for the entirety. By this time, Bagnaia had a three second gap at the front and that’s the way it remained until the checkered flag – perfection from ‘Pecco’ on home soil. Despite the best efforts from Schrötter, including an ambitious lunge up the inside at Turn 14 on the final lap, Oliveira minimises the damage done in the overall standings to take a vital P2. Schrötter finally gets the podium monkey off his back in P3, with Pasini holding off a late challenge from Joan Mir (EG 0,0 Marc VDS) to take fourth on home soil – the Spaniard rounding out the top five. 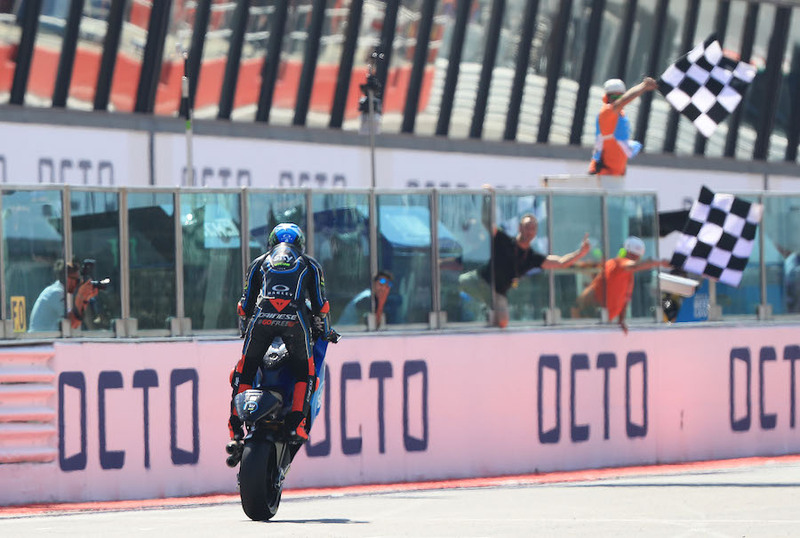 Lorenzo Baldassarri (Pons HP40) fought back from P13 on the grid to take sixth at his home GP, with Fabio Quartararo (+ Ego Speed Up Racing) taking seventh – a slender 0.066 ahead of Red Bull KTM Ajo’s Brad Binder in eighth. Jorge Navarro (Federal Oil Gresini Moto3) looked set for a top six at Misano, however the Spaniard was forced to drop one position after exceeding track limits to Baldassarri who was over three seconds behind at the time – P9 for Navarro. As he continues to recover from injury, Xavi Vierge (Dynavolt Intact GP) earned a fantastic top ten in P10, with 11th place Simoe Corsi (Tasca Racing Scuderia Moto2) leading Remy Gardner (Tech 3 Racing), Dominique Aegerter (Kiefer Racing) and Andrea Locatelli (Italtrans Racing Team) over the line in P12, P13 and P14 respectively. Replacement rider Jesko Raffin (Temporary Lavorint SAG Team) managed to grab the final point scoring position in P15, a solid result for the current FIM CEV Repsol Moto2 European Championship leader. Alex Marquez (EG 0,0 Marc VDS) and Augusto Fernandez (Pons HP40) crashed at Turn 14 on the opening lap, the latter tagging the inside of his compatriot, with Danny Kent (+ Ego Speed Up Racing) and Sam Lowes (Swiss Innovative Investors) crashing out of the race – riders ok. Romano Fenati (Marinelli Snipers Team) was black flagged for irresponsible riding in an incident with Stefano Manzi (Forward Racing Team).